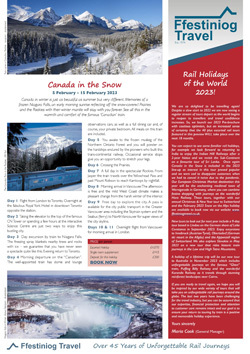 Tick here to receive a copy of our regular newsletter providing up-to-date information about our rail holidays and latest trends within the rail holiday market and train travel in general. Completing the form below is acceptance that Ffestiniog Travel may from time to time mail you details of their latest products and tours. On each occasion you will receive details of how to opt out of any future mailings. Please complete the form below to receive Ffestiniog Travel’s regular e-mail newsletter. In the event that you no longer wish to receive our email newsletters please click the unsubscribe button at the bottom of any of the newsletters you have received and you will be immediately unsubscribed from our mailing list. Tick here to receive a copy of our printed brochure. Spain’s northern ‘Green’ coast is the focus of this 15-day escorted tour, which also makes a short visit to south western France. As well as ample time to explore Bilbao, Santander, Gijón, Santiago di Compostela and Leon at your own pace, enjoy scenic rail journeys between San Sebastian and Bilbao, and on the metre-gauge FEVE network, and experience the ‘petit train de la Rhune’ rack railway as it makes its impressive ascent. Departing 14 June, The Green Hills of Spain and La Rhune costs from £2,400 pp (two sharing), including Eurostar/TGV, 14 nights’ B&B, Global InterRail pass, excursions and tour leader. Ffestiniog Travel provides 'out of hours' support for all independent travellers in the event of an emergency.